There are 16 levels in Diablo. Shortcuts from town that descend directly to level 5, 9, and 13 become available to characters who have reached those stages. These shortcuts can be entered directly in multiplayer mode on Nightmare and Hell difficulty. Otherwise, players must first use the shortcuts to return to town before they can be used to enter the dungeon. Tristram always has the same layout it's not random at all. 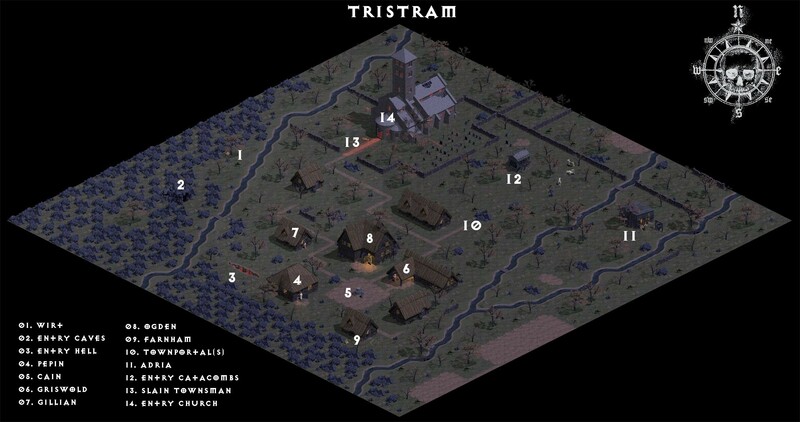 Click the thumbnail to see an awesome, enormous overhead view of Tristram. They may have much higher to-hits than these; such as on a lightly-armoured Sorcerer. But their to-hit is never lower than this. There are no physical damage ranged attackers in Hell. This property is not applied to magical attacks, such as Bloodstars, Flash, or Fireballs, which are calculated differently than melee strikes. Level 16 always has the same layout and monsters; Blood Knights and Advocates each game, with about half of the monsters in pre-set positions. Others are spawned in random locations each game, though. There are no chests, barrels, or cauldrons found on level 16. Since there are always only two types of monsters on this level, and since Advocates are triple immune on Hell difficulty, all characters can benefit from special tactics on this level.